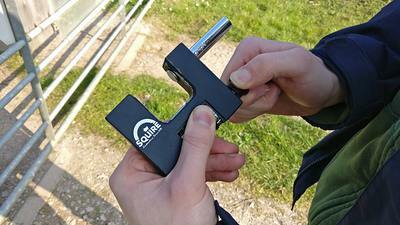 To try to avoid the problems of last year, we have bought a new gate padlock. Here is how it should look when closed. 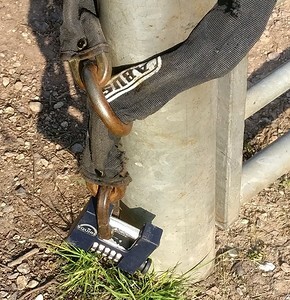 Please note that only one end of the chain is in the padlock. There is a knack to using the new lock so some further instructions are provided below. Please don't leave any of the Club's padlocks with their combinations showing! To open the lock set, the correct combination and then pull the black knob outwards (in direction of red arrow in picture above). The silver bolt should spring out (see bottom photo). To close, thread the oval end of the chain through the ring on the other end of the chain (see top picture). 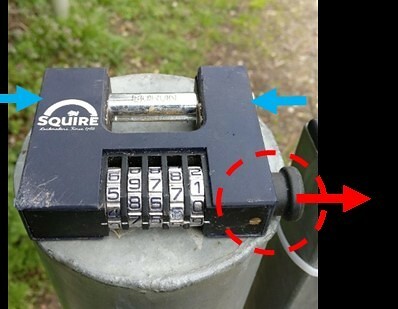 Now put just the oval end in the padlock and push the silver bolt in by squeezing in direction of blue arrows. You should feel it click home. If necessary, while pushing the bolt in, pull slightly on the black knob to help it latch closed. NB You will find it much easier to both open and close the lock if you only put one (oval) end-link of the chain in the lock as is described above.